Dustpan with teeth for collecting junk from your broom brush as you are sweeping up. Its annoying when you are dusting because your broom collects all this junk that you have to constantly remove. 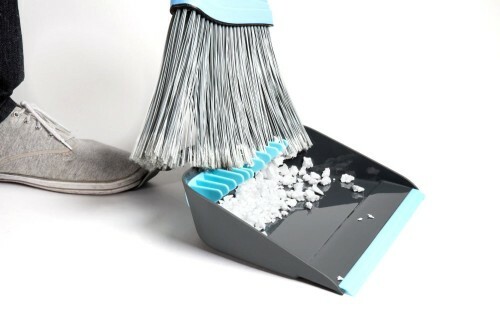 With this dustpan you do not have to use your hands, which is pretty groovy. Rubber teeth at the back of the dustpan collect dust and junk from your broom brush. The handle doubles as a foot rest to keep the dustpan steady. A hole at the end of the handle allows it to be hung up, though that is typical really of dustpans. As dust pans go this is one of the best, though there is not much competition. There has really been very little changes in the design of dust pans so it is nice to see a new take on the idea. The teeth work well with basically any broom and certainly at least drag dust out of it to the tip, if not completely removing it. The foot press in particular helps as it is annoying to use a small broom to dust the floor. I suspect this foot press handle will slowly become standard design for dust pans shortly as it simply makes sense and is only a very minor change. The visual design of the item is so nice as well, it almost looks like they borrowed the color scheme from Tron or something with the teal and grey. 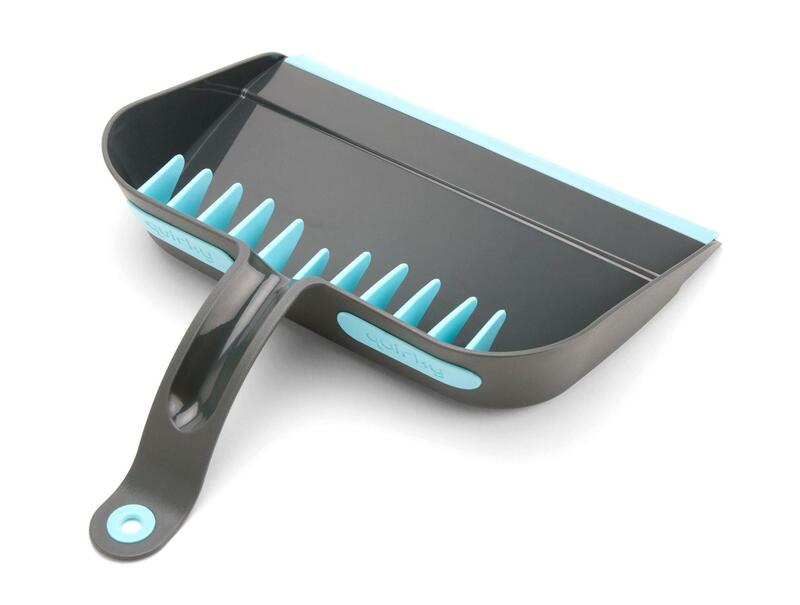 The most futuristic dustpan that was ever a dustpan basically. The teeth on the dustpan could do with being distributed a bit closer together to make sure that gather all the dust. Given that this is the point of the dustpan it is a bit disappointing that this was not a little better designed. Most people have reported that the teeth are close enough together, though, so it is still quite functional. The next negative of the item is that it sometimes struggles to get the junk and such on the brush off completely. What basically ends up happening is that the junk accumulates on the end of the brush, getting stuck, and so you have to take it off the old fashioned way with your hand or wring the brush to flick it off. That said, this dustpan is still probably the best possible dust pan you can get or one of the best. While the teeth fail sometimes to collect dust properly out of the broom, it is still one of the best dust pans you can get as not much innovations has occurred in the dust pan industry.